With an abundance of apples this time of year, how do you like to use them up? In the past, I have made apple cobblers, dutch apple pies, spice apple cake, and homemade applesauce. But, so far this year, I have only made these yummy baked apples in the slow cooker. My mom used to make her version of "baked apples" in a saucepan on top of the stove. This slow cooker version is very similar to those, and they give a nice smell to the house while they are cooking. They are also great to take along to potlucks and family gatherings and - for those who are gluten free, or those who are watching their sugar intake - they are a healthier option than pies and cobblers. You can also do the same thing with an overabundance of pears. For a 4 quart slow cooker, you will need at least 6-8 large apples, or double that if they are small. 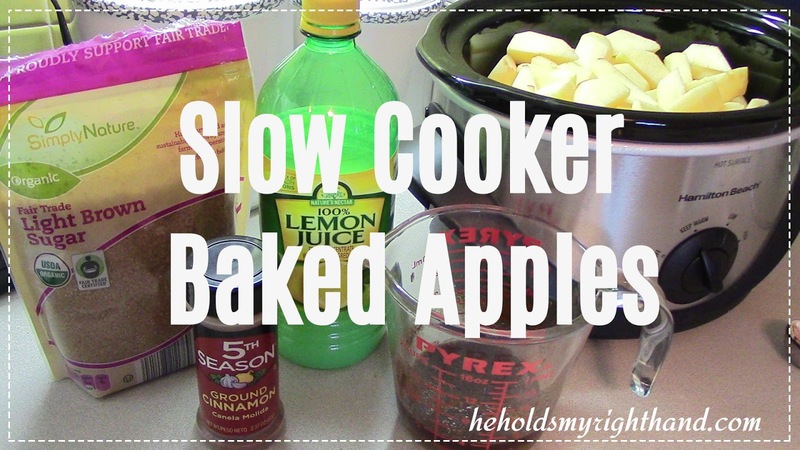 Peel and slice the apples and place into the slow cooker. You will want enough apples to almost fill the slow cooker. Mix together 3 TB of melted butter, 2 TB of lemon juice, 1 tsp of cinnamon, and 3 TB of brown sugar or honey. Pour the mixture over the apples and gently stir to evenly coat the apples. You have the option of also sprinkling 2 more TB of brown sugar on top if that is what you are using. Cover them and cook on low for 4 hours, high for 2 hours. Stir and enjoy! I forgot to get a photo of the finished apples while in the slow cooker, but here is a look at some of the leftovers. Everyone in my family loves these, except for my son. He doesn't like the "mushy" texture, as he puts it, and prefers raw, crunchy apples; but to each their own. The recipe is below if you want to print it out and make this dish for your next church potluck or Fall fellowship. It is always good to meet together with others, especially other Christians, so we can be encouraging one another in our Faith. Unfortunately, living in this world is not getting any easier, but we can lean on each other for strength. My mom used to make her version of "baked apples" in a saucepan on top of the stove. This slow cooker version is very similar to those, and they give a nice smell to the house while they are cooking. They are also great to take along to potlucks and family gatherings and - for those who are gluten free, or those who are watching their sugar intake - they are a healthier option than pies and cobblers. You can also do the same thing with an overabundance of pears. Peel and slice apples to almost fill a 4-quart slow cooker. Mix butter, lemon juice, cinnamon and brown sugar (or honey), and pour over apples. Stir gently to mix. Cover and cook on low 4 hours or high 2 hours.